From all the bloggers at Craft Hackers, we wish you a safe and happy Halloween! 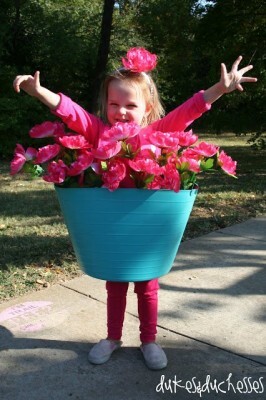 From Dukes and Duchesses, a simple but effective flower pot made with dollar store items. Super easy and on the cheap! 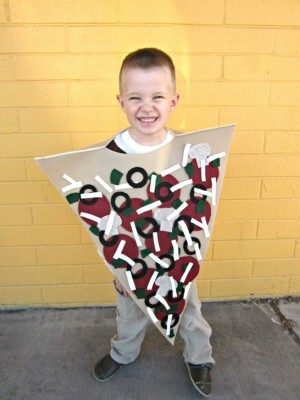 Or how about a quick slice of pizza from UCreate Crafts? Or perhaps an homage to the crazy cat lady in all of us from Design Dazzle? 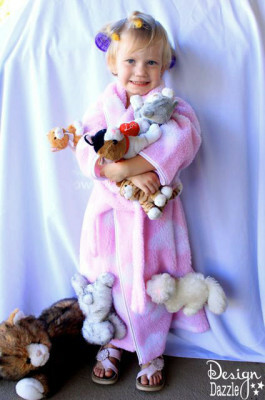 A great use for all those plush kitties! If you are a regular reader, you may have noticed that my post comes a little early this week. That’s because tomorrow Toni has a super exciting announcement! Curious? You’ll have to wait! I’ll be back with your regularly scheduled Sunday post next week. Have a great holiday and stay crafty! One of the first things I learned when I was young was how to cross stitch. I remember sitting at the kitchen table with graph paper and colored pencils figuring out the patterns I wanted to make. I wish I had something like this back then. MagnaBitz are tiny magnetic-backed colored tiles used to help create and recreate all of the characters from your childhood, classic video games, and your own imagination. For as little as $5 you can get 100 pixels in 1 color of your choice! So there’s a couple days before Halloween and there’s still so much to do. If you haven’t started decorating yet and you want to do up your house for all the guys and ghouls to see, then here is a last minute DIY projects. This super easy tutorial is really fast and can look so amazing when it’s done! You need as many glowsticks for however many hands, and the same for the number of straws. All you need to do is keep the straw against the inside of your arm and palm. And then you need to wrap your hand in masking tape with the sticky side against your skin. You may want to put some lotion on your hand to make it easier to remove when you’re finished. Once your hand is all taped up, use the straw as a guide to cut up to the finger. Once you’ve done this, you can just tape the cut shut. You can keep the straw inside the hand to anchor it to the ground. When you’re ready to go, just crack your glowstick and insert into the casing. Looks great right? A few of these on your lawn glowing in different colours is a great effect. You can get even more creative and do the same thing to your foot, and even paint them with blood! You could even use green “painter’s” tape to make a glowing green hand. If you’re feeling really ambitious, you can open your paint brushes and paint some bones or cracks or other things on them. I’m a little late to the part this year in terms of pumpkin carving, but having seen a month’s worth of news about Halloween, I realised this kind of discussion was lacking. There are oodles of tutorials on how to carve your pumpkin, but very little on how to select that pumpkin to begin with. This came to me after a discussion I had with my green grocer, who had dragged me to his back room to search for the “best” pumpkin available as he deemed the one I had picked insufficient. I, on the other hand, was perfectly happy with my choice, and actually happier than I normally am when I’m not able to hit a pumpkin patch and pick my own. The question is, what makes the perfect pumpkin for carving? A lot of people will instinctively tell you Size, but that has never been metric. 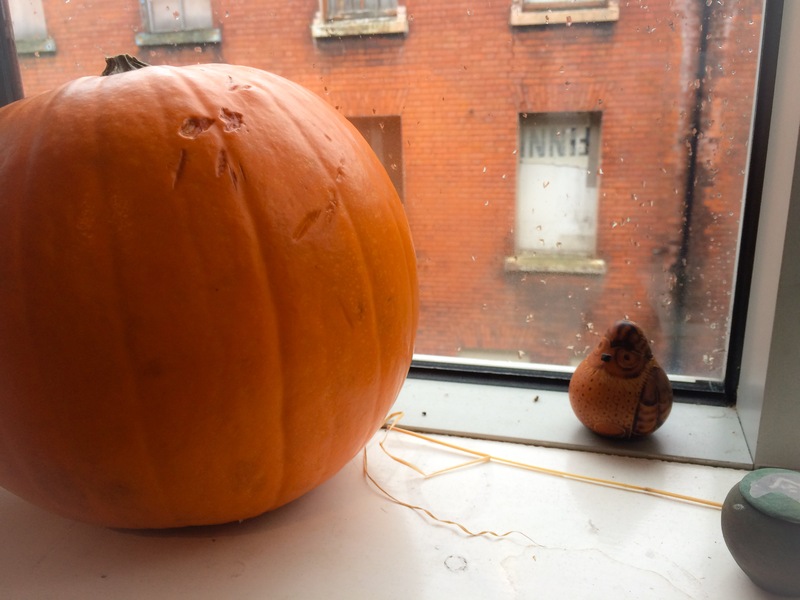 While size is helpful, you can still carve small and large pumpkins quite successfully as the myriad of tutorials on how to carve pumpkins on the web will show you. No, for me size is only important in that I prefer a pumpkin where I will be able to get my fist in easily once I’ve cut the top off. I’ve nothing against big and small pumpkins, but I don’t need them to make me feel like I’ve gotten the authentic experience. Store pumpkins typically cut their stems very short. Good for packing them into crates, and the stems don’t dry up and look shrivelly which might make folks not buy them (although why not I don’t get as I actually feel this gives them more character). There is nothing worse than trying to lift out your pumpkin’s lid only to have the stem slip from my fingers time and again. Ok, sure, I could use a knife or something else but when I’m lighting candles, I don’t like to have to do that as well. It also makes placing the lid back on more than a one hand operation. So I look for the longer stems now. This is also important if you want to go for a non-top loaded pumpkin. The clever faces using stems are less appealing to me when they have flat smooshed stems as their noses. Pumpkins can take quite a bit of battering, but I like to find one that doesn’t look like its gone several rounds in the ring. There are two kinds of blemishes I look at- indentations/bruises and what I call facial scarring. Indentations are the bruises the pumpkin has. While they are unlikely to spoil the look of your pumpkin when its lit, they can speak to the life expectancy of your pumpkin. 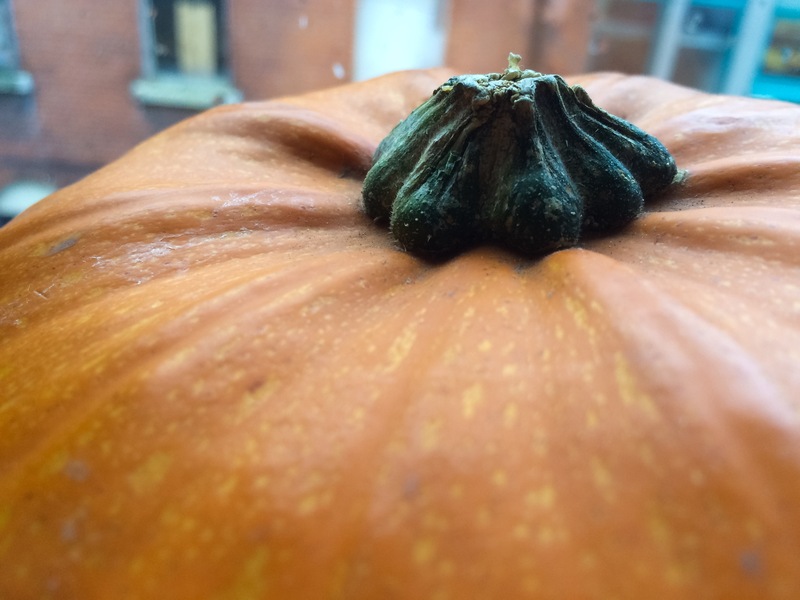 Speaking to my green grocer this weekend, he confirmed what I’d always suspected- the more bruised your pumpkin the more likely your pumpkin was picked a longer time ago. Fresher pumpkins don’t have the time to get significant bruising that show up, so if a pumpkin has a lot of bruising it may not last as long. 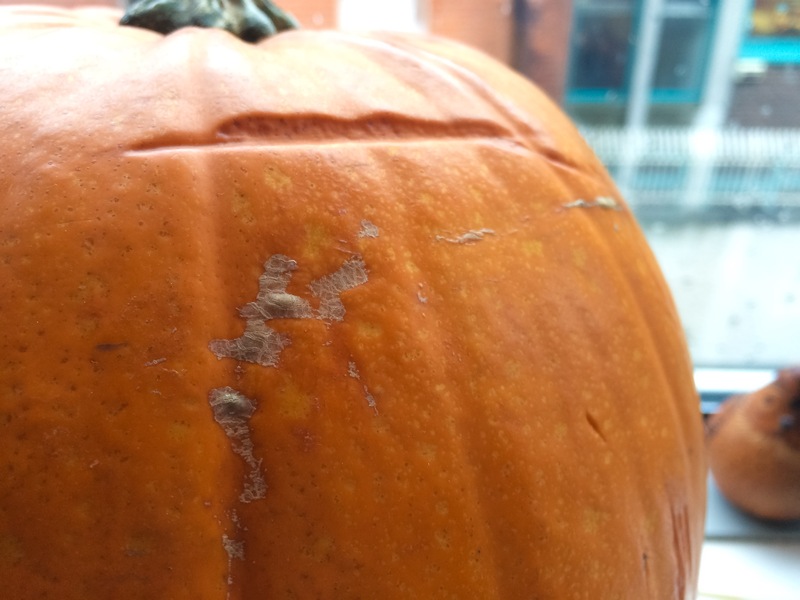 Facial scarring is what I call the callous like growths sometimes found on pumpkins (the white yellowish scabs in the picture above). 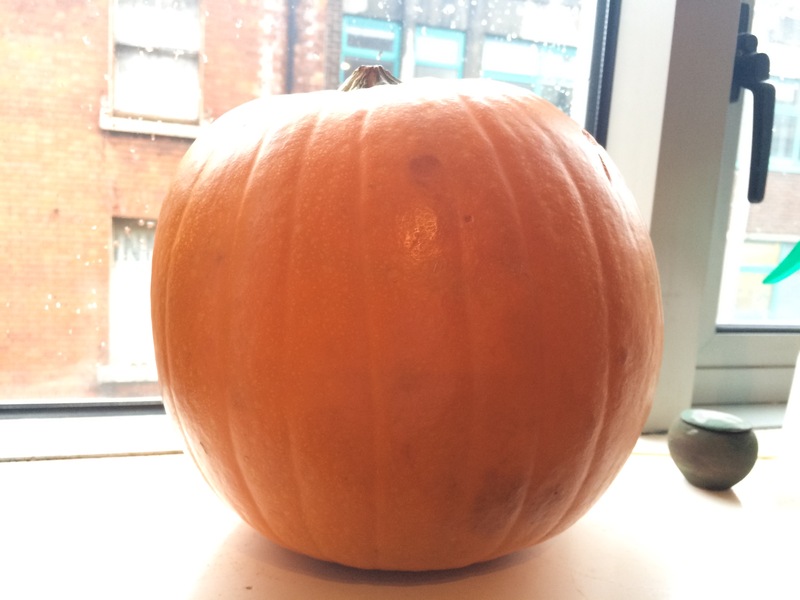 They’re usually light coloured and are where the flesh of the pumpkin actually healed at one time during its growth. These I’ve found can actually show while a pumpkin is lit, because the blemish is thicker than the rest of the skin of the pumpkin. I check the placements of these, because the last thing I want is for them to ruin the look of my pumpkin’s face, which is my last, and most important requirement. What do I mean by good face? I look for a section of the pumpkin that is almost one side where there is almost no blemishes at all, or that that placement of the blemishes will likely be removed when I’m carving. I prefer my face to be on the larger side of the pumpkin if its possible, but sometimes finding any pumpkin with a good face is difficult, so I take what I can get. I do find that the face on a pumpkin also determines the face I carve on it. This year’s is going to be a sideways face, so I’m thinking it will be goofier, rather than scary. There’s a character there, and rather than just pushing ahead with any old face, I like to bring out the face I think my pumpkin has. Those are my requirements, but do you have others? I would love to hear about it on our forums. Great for the 6 and under crowd, this is a simple and cheap treat that young kids can enjoy and play with right away! 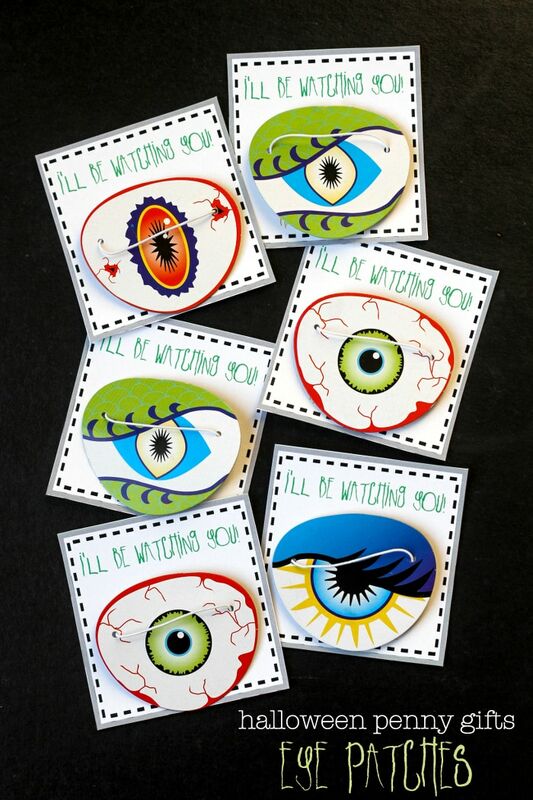 All you need are some party store eye patches, paper and glue dots. The bane of all bare footed adults, but kids of all ages love Legos! If you have a Lego store near you, then these are still feasible to make by this weekend (bagging Legos and tying them closed doesn’t take long after all) but orange isn’t always a common color so they might have to be ordered from Lego directly. I thought this was a nice twist on the classic slap bracelet look for Halloween. 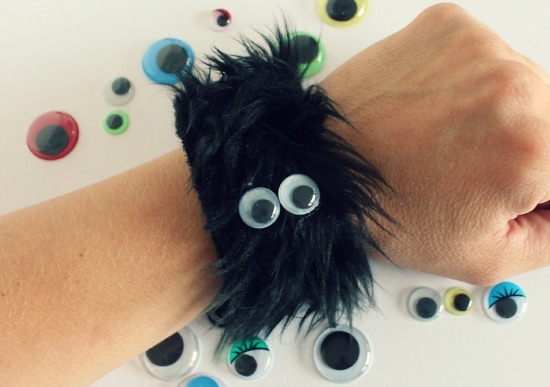 All you need is some faux fur fabric, E6000 glue, and googly eyes! Not a gift for the very young though as those eye can be a chocking hazard. 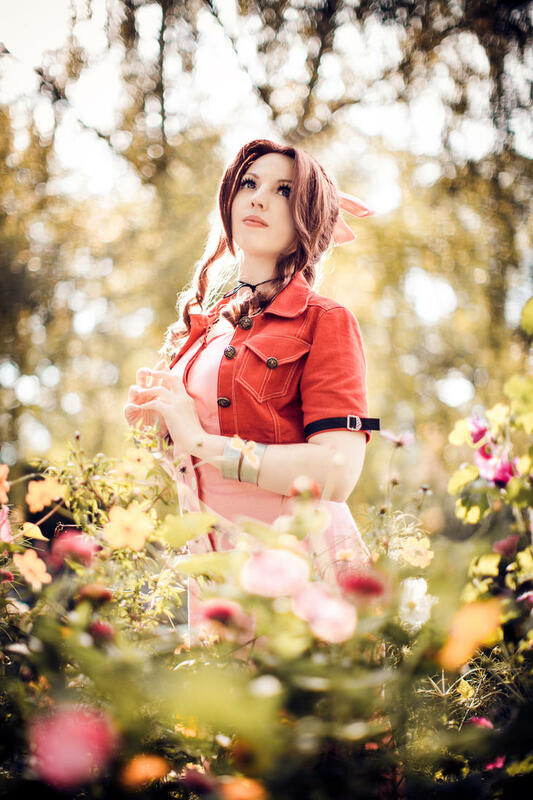 Halloween is less than a week away and I am super excited! 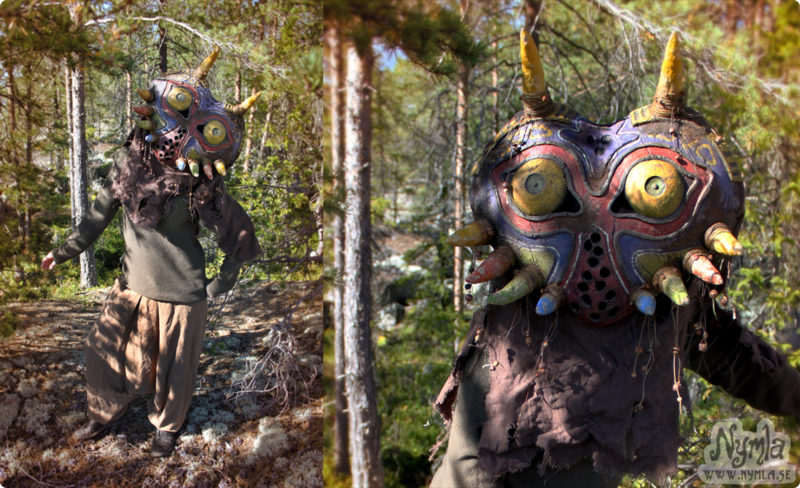 I love seeing all of the creative costumes that people come up with on their own. In fact, I think they should get some kind of award for their hard work and ingenuity. Behold! 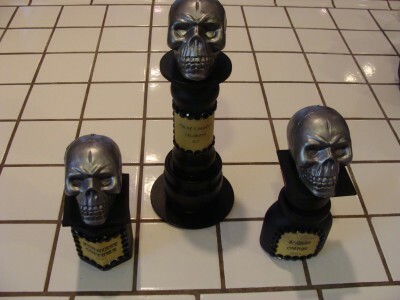 Three easy (and cost effective) tutorials for creating your own Halloween costume contest trophies! 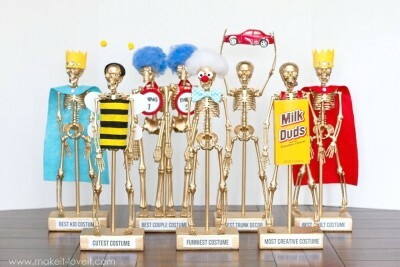 These are definitely for those costumes that are a”head” of the rest! Who wouldn’t want to proudly display these bits of bling? Just think of how many other categories you could feature! I found quite a few other tutorials that included many items from the dollar store and the big box craft stores for very little money but I also would encourage you to check out your local thrift and re-sale shops for supplies. It’s amazing what a little glue and spray paint can do! I’ll see you in the candy filled aftermath next Sunday. Stay crafty! Bonus Meet the Hackers weekend!!! Today is a one day event in Woodbury Heights, NJ called South Jersey Geek Fest. 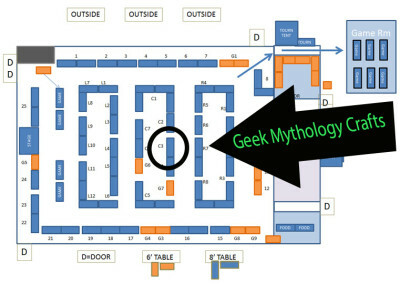 Geek Mythology Crafts will be there with their custom sprite creations and software so they can design and print your very own sprite at the table! 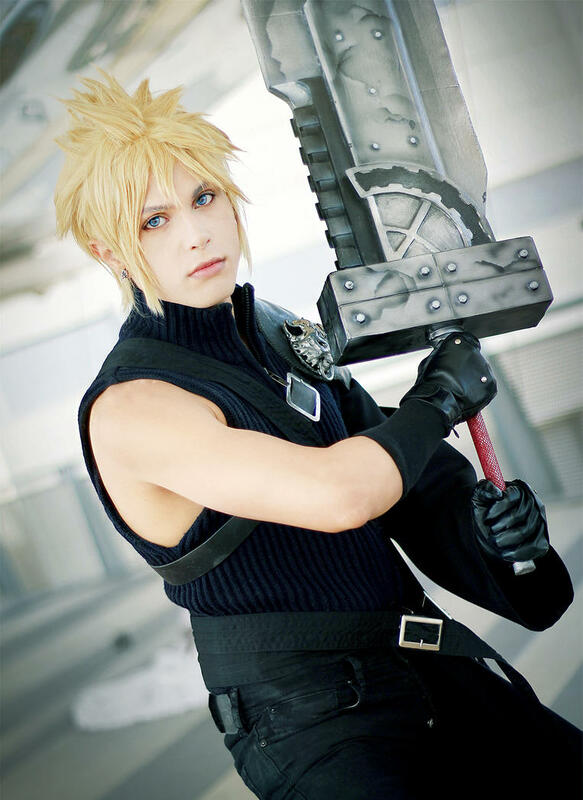 SJ Geek Fest is a celebration of your geekery featuring comics, art, tabletop games, music, video games, YouTubers, Yo-Yo’s, cosplayers and much much more! 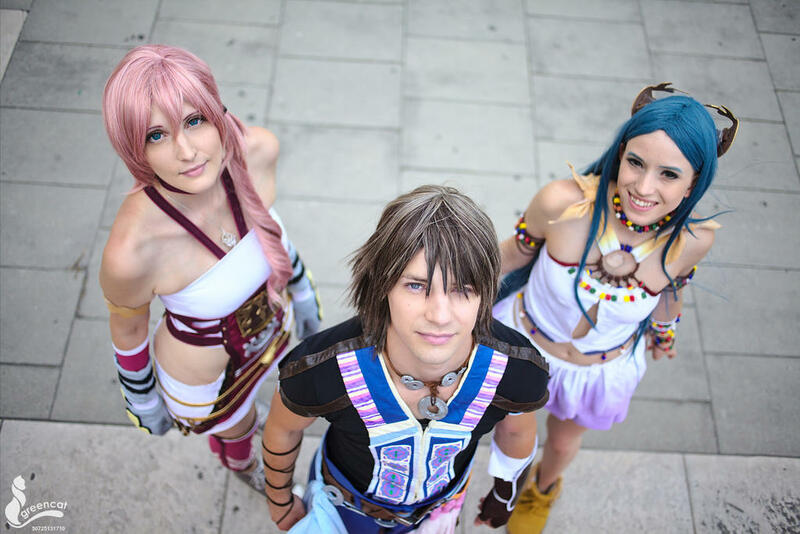 They’re a small event with a lot of heart and -according to their site- 100% fun. 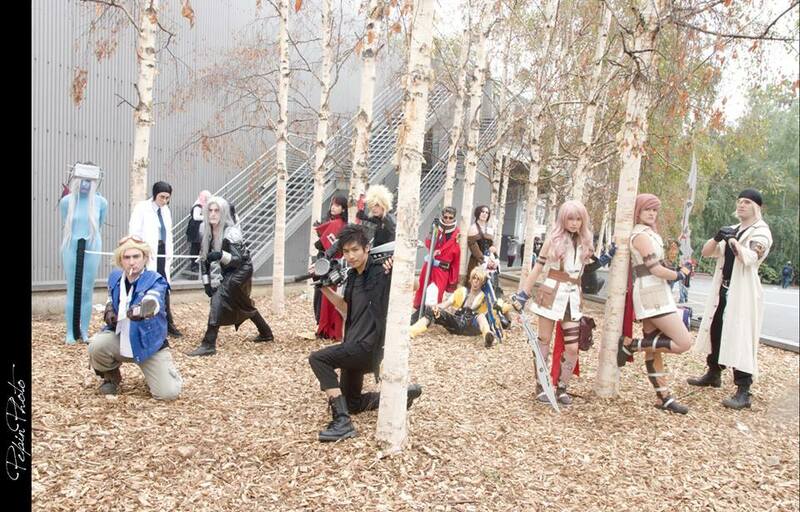 XD With hours running from only 10am – 5pm, it looks like a great way to spend part of your weekend that isn’t filled with Halloween activities. So if you are near or around the New Jersey area, make sure you swing by Geek Fest and by sure to say hi to Geek Mythology Crafts if you do! 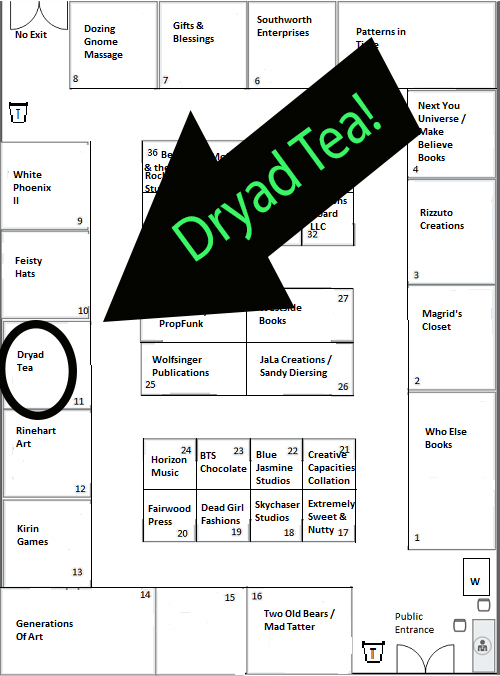 So if you are a fantasy/sci-fi fan in the Colorado area and need to get your fix, then swing by the Hyatt Regency at 7800 E. Tufts Ave. in Denver, and make sure you tell Dryad Tea hi! As those of you who have been reading know, I am all about Halloween decorating, especially on the cheap with all the mad DIY skillz you can muster. Today I bring you an inexpensive, easy and thoroughly impressive way to light up your home. This would work particularly well in hallways but I think you can do it in any indoor room of the house. I say indoor not because of any fire hazards, but because you don’t want the wind to ruin your sense of awe. That’s right! This is going to be a tutorial on recreating the candles that float around Hogwart’s on special occasions. I am going to be using pictures from this tutorial as well as some of the steps, but not all of them may work for what you have around the house, so remember to improvise. I’ll also give other alternative recommendations for ways you can do the same thing. This isn’t too complicated but, realistically I should have probably posted this weeks ago so you could start saving some of the supplies that are needed. The good news is that this mood lighting doesn’t need to be just for halloween, but it can be for Christmas as well. Or really any cool party that you want amazing lighting for. There are many different ways that this tutorial can be done. You can find them all over the internet. I’m going to post some photos from the various tutorials around, (as well as some links to their pages) but I’m going to give you some of my own methods and suggestions that would make things a little bit easier. First, your tools: A selection of toilet paper and paper towel rolls, scissors, a hot glue gun, white (or off white) craft paint and a brush,some white paper, a push pin, some fishing line and some heavy duty tape. You’ll also need as many LED tealight candles as you have toilet paper rolls. You can decide the best number for your hallway. The first part is easy. Cut down any paper towel rolls to the sizes you want. It’s good to have a variety of sizes but going smaller than a toilet paper roll will make them look a little stubby so try to keep them longer than that. Next, you’ll need to apply your first layer of white paint around the outside of your tubes. Allow this to fully dry before moving on to your next step. For this step, there’s a couple of ways to achieve the desired effect. The one that I think is probably the easiest is with a glue gun, where you basically let the glue drip like candle wax down from the top. Before you do anything else with these, allow them to dry. Another DIYer recommended using thin foam to glue to the tops rather than having dripping glue, but they used a special cutter to get them looking nice, not scissors. 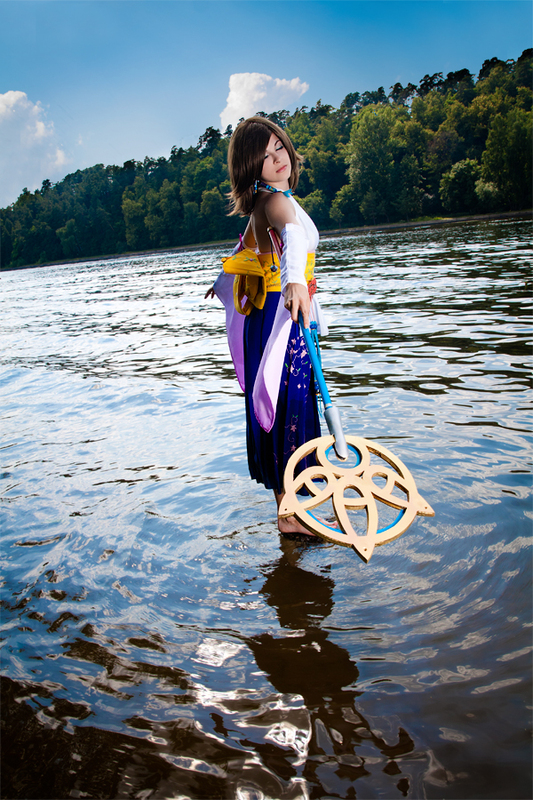 (that tutorial is here). Remember to keep the glue on the outside of your candle so that it’s easier to deal with the LED lights inside. Next, the step illustrated above might seem a little convoluted, but bear with me. The reason for dipping the top of the candles in paint rather than using a brush is so that the brushes don’t leave brush strokes on the glue. Alternatively, if you can find a way to spray paint them without spray painting everything else around, that would be an amazing option – this you could do in a couple of stages, spraing first the top half then the bottom to get full coverage. The next step is easy. You want to trace a circle of paper the size of the tube and glue this to the bottom of your candle. You don’t want people to see that your candles are hollow. We’re getting closer to the end. The next step is to insert your LED light into the top of the tube. Now, the tutorial writer claims that it should sit on the fishing wire without falling as the rest of the tube will hold it up. For me, I would probably pull the string out from the top of the tube to tape it to the bottom of the candle just to be sure. Just make sure, however you decide to put them inside, that you will need to access the bottom to turn them on. Very important. Your last step is to affix them to the ceiling. If you have a ceiling like mine that is flat, you can use some tape to hold the loop of fishing line in place since they’re not heavy. If you have a different ceiling, you may have to get creative. If your ceiling cannot be taped, you will basically need to put up a fabric drape to hold them. You can either make one – This tutorial goes through it, or you can use tulle (which is found at your local fabric store) or a blanket or tapestry. If you need to use a hanging, all you need to do is either safety pin the fishing line to the fabric (with the pin on the underside) or use small Christmas ornament hooks . This image from diyave.com. A great example of someone using a galaxy tapestry as a hanging device. When you get everything turned off and your candles turned on, you will have a magical ambiance that looks hugely impressive!